The Greek Gods are into resource management. 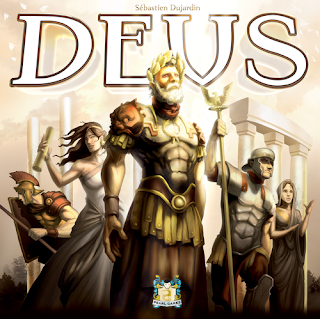 Deus is a mid-level strategy game that will keep you coming back for more plays. Game play takes place on a modular board that is set up randomly in different configurations for 2, 3, and 4 players. Each modular tile consists of a barbarian village, a wheat field, a forest, a swamp, a mountain and 2 sea regions. The object of the game is to accumulate more points than the other players. Players gain gold, resources, abilities, and victory points by purchasing a card from their hand and placing it in their tableau. This purchase of the card triggers the ability of that card and the placement of a building in one of the regions on the board. There are 5 different types of building cards with matching buildings, plus a set of 16 unique temple cards and 7 temple buildings. One of the key elements of the game is that as cards are purchased they are placed in a player’s tableau in the column relating to its building type and above the previous placed card in that column which in turn triggers the ability of every card in this column. Beginning with the bottom card (the 1st card placed) the abilities are activated in order in which they were placed in the tableau ending with the most recently placed card. Since there are 5 buildings of a type, the 1st card in each column type can be triggered up to 5 times during the course of the game. Therefore, it is critical to get the cards placed in an order that maximizes their value. Temple cards are the major source of victory points at game end. Each yields points in a different way. The 1st temple card can be purchased and placed in a player’s tableau in the temple column at any time. Before a player can placed a 2nd temple card he/she must not only meet its purchase cost but must have at least one building card placed in each of the 5 building columns on their tableau. The 3rd temple card requires its cost and at least 2 cards in each of the 5 building columns, and so forth as each temple card is placed in a player's tableau. Another key function of the building cards is their discard use (Offering action). In place of purchasing and placing a card in their tableau, a player can discard any number of cards from their hand and replace them from the draw deck. He/she will choose one of their discarded cards to activate its building type discard ability. Discarding can yield players valuable resources, gold, an increase in the number of cards in their hand, more buildings to their tableau from their supply, and victory points. The Offering action gives players an opportunity to do something positive on every turn especially when they don't like the particular cards in their hand and to see a wide variety of cards. Game end is triggered when one of 2 conditions occurs: all barbarian villages have been conquered or all of the temple buildings have been placed. Additional end of game points are tallied from temple cards, most resources on hand, and most gold on hand. 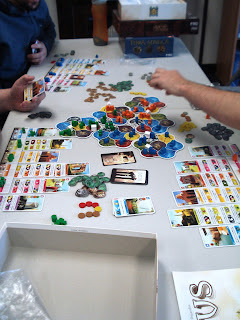 There is significant tension throughout Deus as players decide whether to build deep in 1 or 2 building types to maximize the abilities of the respective cards or to build buildings of all types to facilitate the purchase of point producing temples. We have an open copy of Deus available in our Demo Games Library for you come in and try.